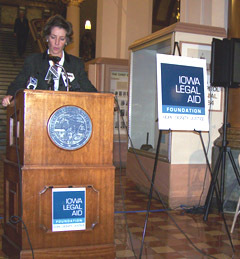 Iowa Legal Aid has started a charitable foundation to raise more money to help poor Iowans who cannot afford their own lawyer. Iowa Legal Aid executive director Dennis Groenenboom says the need for the group’s legal services is growing, particularly in the area of property rights. Former Iowa Governor Tom Vilsack is on the Iowa Legal Aid Foundation’s Advisory Council along with Ray. Vilsack cites the fact that while those who cannot afford a lawyer get one appointed for them in criminal court, that’s not the case in civil court. Culver, like former Governors Ray and Vilsack, is a lawyer and all three are serving on the board of directors for Iowa Legal Aid’s fundraising effort. Find more information on-line at the Legal Aid website .